The G7 ended Saturday, and yet the fallout still continues. Team Trump continued to go on the offensive against America's (former?) allies, and the allies began to push back. At the moment, the current target of the President's ire is Canadian prime minister Justin Trudeau. At his press conference on Saturday, he said that he found Donald Trump's basis for retaliatory tariffs—"national security"—to be insulting. On Sunday, Trudeau expanded on that point, telling NBC's Chuck Todd that he is having "a lot of trouble getting around" that Canada has abruptly become "a national security threat to the United States." He opined that U.S. and Canadian soliders, "who had fought and died together on the beaches of World War II, on the mountains of Afghanistan and have stood shoulder-to-shoulder in some of the most difficult places in the world, that are always there for each other, this is insulting to that." This seems a pretty reasonable point of view. In fact, it's actually somewhat restrained. What Trudeau easily could have said, as the New York Times' David Leonhardt points out, is that Trump—as is so often the case—is lying. The tariffs are not the atrocity that the President pretends they are; the average tariff between the U.S. and Canada right now is 0.8% (with the other members of the G7, it's only slightly larger, between 1.4% and 1.6%). Nonetheless, Team Trump has decided to respond with outrage. Although the President himself is in Singapore, several of his underlings went on the Sunday morning news programs to body check the Canadian. National Economic Council chairman Larry Kudlow claimed "betrayal" by Trudeau, accused him of a "sophomoric political stunt for domestic consumption," and said he "stabbed us in the back." Trade adviser Peter Navarro was even more unhinged: "There's a special place in hell for any foreign leader that engages in bad faith diplomacy with President Donald J. Trump and then tries to stab him in the back on the way out the door." That's a very interesting argument. However, if bad faith negotiations coupled with personal attacks afterward really do earn a politician a one-way ticket to hell, it's probably not Trudeau who needs to be worried. ....Germany pays 1% (slowly) of GDP towards NATO, while we pay 4% of a MUCH larger GDP. Does anybody believe that makes sense? We protect Europe (which is good) at great financial loss, and then get unfairly clobbered on Trade. Change is coming! Those tweets were spread across a couple of hours, so clearly the matter lingered on Trump's mind. In any case, if there is anything that is certain about this spat, it is this: There is no chance that Team Trump is actually this offended by what Trudeau said. Their response continually misrepresents what the Prime Minister said, is highly coordinated, and is way too over the top. All of these things are clues that the Donald and his underlings are consciously trying to create a mountain out of a mole hill. Why? Presumably to please the base, or to distract attention from Trump's performance at the summit, or both. Trump is an authoritarian who just naturally gravitates toward other authoritarians. Trump just likes doing the opposite of what his predecessors, particularly Obama, did. Vlad Putin really does have kompromat on Trump, and all of this is at his bidding. Trump is surrounded by isolationists like John Bolton, who are bending him to their will. Trump actually buys Steve Bannon's argument that the "Fourth Turning" is upon us, and the world must burn. There is no rhyme or reason, and Trump just responds instinctively to whatever that morning's (Fox) news is. Authoritarians, who are skilled at using emotion to manipulate people, are well equipped to manipulate the emotion-driven Trump. Democratic leaders, who rely more on reason and logic, have the wrong toolkit for dealing with Trump. Maine: Gov. Paul LePage (R-ME) is term-limited and not very popular, so he is not on the ballot. In fact, even when he twice won the governor's mansion, he wasn't very popular. In 2010 he got only 38% of the vote; in 2014 he managed to raise that to 48%. The reason he won at all was due to the presence of an independent candidate both times, Eliot Cutler. Mainers took that experience to heart and decided that maybe the real problem was the election system, so they junked the old first-past-the-post system and adopted instant runoff voting. In this system, which is making its maiden voyage in an entire state tomorrow (although a few cities use it), voters get to indicate a first choice, second choice, third choice, etc. If any candidate gets 50% +1 votes, he or she is elected. If not, the candidate with the smallest number of votes is eliminated and those votes are redistributed based on their second choices. This process is repeated until someone gets over 50%. The idea is to prevent fringe candidates backed by a small number of ardent supporters, from flipping the election in a way they really don't want. Imagine what would have happened if the 92,000 people who voted for Ralph Nader in Florida in 2000 had been allowed a second choice. Most likely Al Gore would have been become president. Or more recently, if the 172,000 people who voted for Gary Johnson and the 51,000 people who voted for Jill Stein in Michigan in 2016 had been able to indicate a second choice, Donald Trump might not have carried the state by 11,000 votes. With IRV, you can have your cake and eat it: You get to register a protest vote, but you also get to hold your nose and say which of the major party candidates you hate less. If this works in Maine, it could go national. For the record, four Republicans are competing for the GOP gubernatorial nomination in the Pine Tree State and three Democrats are trying for their party's nomination. Democrats are also targeting Rep. Bruce Poliquin (R-ME) in ME-02, with four candidates running, so IRV could play a role there, too. Nevada: In contrast to LePage, Gov. Brian Sandoval (R-NV) is very popular, but he is also term limited, so there will be a big battle to replace him in this bluish swing state. The Republican candidate, Adam Laxalt, has politics in his blood, literally. He is the son of former New Mexico senator Pete Domenici, who had an extramarital affair with Michelle Laxalt, the daughter of one of his Senate colleagues, Paul Laxalt. While sleeping with the daughter of a fellow Republican senator from a neighboring state does not violate any of the Senate's arcane rules, it is considered a bit tawdry and Domenici didn't tell anyone until 2013, when he was 80 and Adam was 34. Adam Laxalt is the state's attorney general. He once worked for NSA John Bolton. The Democrats have two gubernatorial candidates, neither of whose names rolls off the tongue easily: Chris Giunchigliani and Steve Sisolak. Chris G., as she likes to be known, is an old-school liberal. Sisolak has good connections to the casino owners, who play a big role in Nevada politics. Also of interest tomorrow is how well Danny Tarkanian, the son of legendary UNLV basketball coach Jerry Tarkanian, does. He originally planned to challenge Sen. Dean Heller (R-NV), but the GOP establishment talked him out of it and promised to shower money on him if instead he ran for the House seat being vacated by Rep. Jacky Rosen (D-NV), who will be Heller's general election opponent. North Dakota: It's going to be a boring day for big fans of North Dakota politics. Sen. Heidi Heitkamp (D-ND) is running unopposed for the Senate and Rep. Kevin Cramer (R-ND) has an unknown challenger who has no chance. The only action in town is the four-way race for the Republican nomination to replace Cramer. The Democratic candidate, Mac Schneider, is unopposed. South Carolina: Gov. Henry McMaster (R-SC) got to move into the governor's mansion when Nikki Haley resigned to become ambassador to the United Nations. Now he has to earn the job. He is likely to come in first in a three-way race, but probably won't hit 50%, forcing a runoff against either Catherine Templeton, a former member of Haley's cabinet, or businessman John Warren. The Democrats also have a three-way race for governor, but the prize there is not worth so much in this very red state. Of more interest to the Democrats will be SC-05, where the Party will be rooting hard against one of their own. Yes, you read that right. Archie Parnell wants a rematch against Rep. Ralph Norman (R), to whom he lost to by only three points in the special election to replace Mick Mulvaney. It looked like he would get the rematch with ease until it came out that he has been guilty of spousal abuse in the past. The DNC and DCCC called on him to drop out, but Parnell refused. If he wins, then he'll be an anchor around the Party's neck, and he will also force them to withhold support from an otherwise winnable district. He's got three Democratic opponents, all of them unknowns with very little money, so he has an excellent chance of surviving and thus dashing the blue team's hopes. Virginia: What a difference a decade makes. The GOP hasn't won a statewide race in the former capital of the Confederacy in nearly 10 years and this year won't be any different. The Old Dominion State has become so blue that the Republicans couldn't even find a decent candidate to run against Sen. Tim Kaine (D-VA). Most likely the nod will go to Minnesota native Corey Stewart, who isn't actually running on a platform to put up more statues of Nathan Bedford Forrest and Stonewall Jackson, but he would probably like to, and sure doesn't want to remove the existing ones. The biggest prize is the Democratic nomination to take on Rep. Barbara Comstock (R-VA), who is in the fight of her life in VA-10, a D+1 district. The Democrats will go all out to flip this one, but the primary is a mess. State senator Jennifer Wexton represents a district in Loudoun County, so she has a base there. She is facing three well-funded rivals, one of whom is running an ad comparing Donald Trump to Osama bin Laden. However, Donald Trump and Kim Jong-Un may have very different definitions as to what denuclearizing the Korean Peninsula means. For Trump, it means that North Korea eliminates all of its nuclear weapons, rockets, and facilities to construct new ones. In his view, the U.S. doesn't have to do anything, because South Korea has no nuclear weapons. In contrast, Kim's view has always been that part of the deal is that the U.S. fold its "nuclear umbrella," meaning removing all nuclear weapons from the Pacific. Japan and South Korea are not likely to be too keen on that. In fact, absent U.S. protection, either or both might rush to develop their own weapons (even though that might run afoul of Japan's constitution). Trump has advanced a vision of American democracy that paints the President as all-powerful, the Attorney General and the Congress as his handmaidens, the top law enforcement and intelligence agencies as corrupt bureaucrats. If Trump's team takes Mueller to court over a subpoena, the judiciary, too, could find itself riven by politics...Trump's strategy may in the end prove ironic. 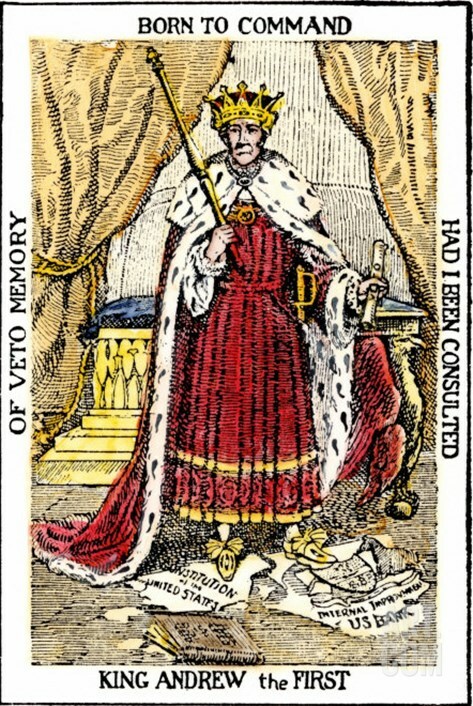 His claims of unchecked power could end up leaving behind a damaged Executive office and a weakened federal government. But for Trump and his team, all that matters is the president's survival. 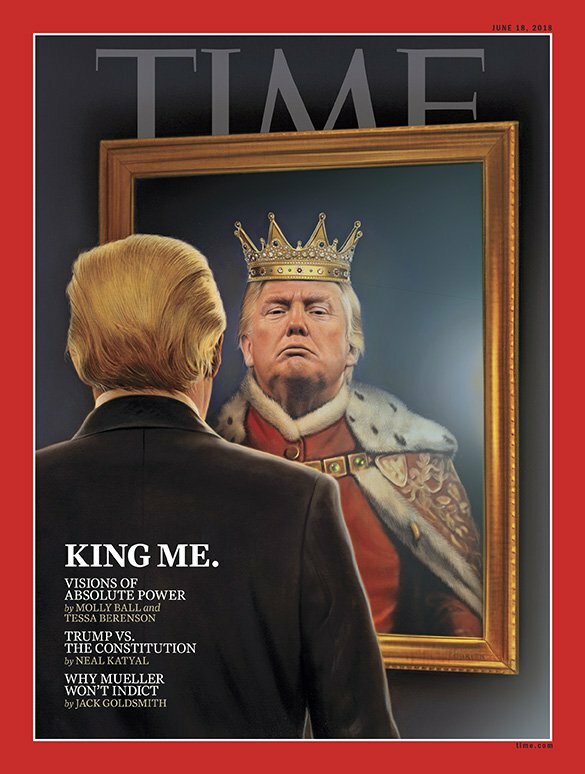 It's a pretty provocative argument to make, but we are now 18 months into the Trump presidency, and so there's now a great deal of evidence for the magazine's claims. Further, Time is the dean of American newsmagazines—they are not prone to wild, unfounded declarations, like Mother Jones or the National Review sometimes are. On Sunday, Politico reported on a small, but instructive, king-like habit that Trump has. By law, he is required to keep all official communications for archival purposes. However, he likes to tear paperwork up, particularly that which displeases him. And so, staffers are compelled to go through the trash, pick out the bits of torn-up paper, and then try to put them back together with scotch tape. This may seem minor in the scheme of things, but it has all the elements of Time's argument: selfishness, disregard for the law, and underlings who scurry around behind the scenes to clean things up and rein in the President's behavior. Suppose you like Netflix but are stuck with Comcast as an Internet provider. Yesterday, Comcast had to provide access to Netflix because the law said it couldn't block Netflix or any website for that matter. Starting today, if Comcast can get a really great deal from Netflix's competitor Amazon Prime, it could simply decide to block (or slow down) Netflix. If you don't like that, you could look for a new Internet provider, but good luck, since in many areas there is only one. In other words, welcome to the new world without net neutrality, a world that starts today. To give a more political example, suppose Fox News decided to pay Comcast to block the New York Times, Washington Post, CNN, and other "fake" news outlets it felt were detrimental to the message it is trying to convey. Yesterday, that would have been illegal. Today it is just business between two companies and perfectly legal. Donald Trump is fond of pointing out how great the economy is doing, claiming it is the best economy ever. In a sense it is. In fact, it almost always is. 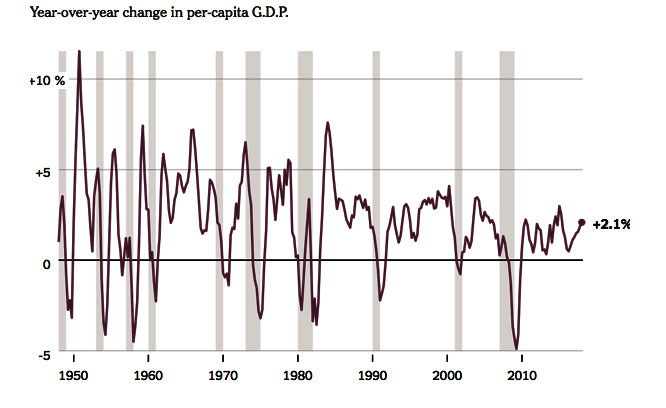 The New York Times has put together this graph of GDP per capita (corrected for inflation) over time. 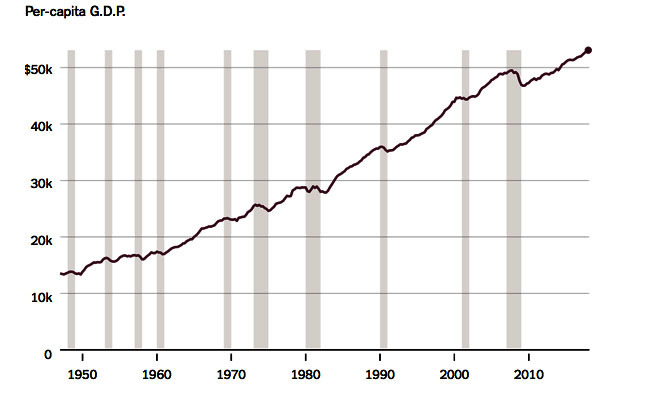 The first thing to note is that except for a number of brief recessions (shown in gray), all presidents since Harry Truman could legitimately boast that the economy has never been better and that GDP per capita is at an all-time high. This graph suggests that the economy keeps growing on its own and the president has a limited effect or influence, except in the very short term. Hollywood has a well-deserved reputation for being liberal. So too does the music industry. But of all the major entertainment awards, none are more lefty than the Tonys. This is largely due to the demographics of the community, which includes a sizable number of New Yorkers, people of color, union members, Jews, and LGBT folks, all of them very left-leaning constituencies. Anyone who did not know this was made aware of it on Sunday night, when the latest round of Tonys was handed out. In fairness, most folks tried to be at least a little bit subtle; wearing "Time's Up" or ACLU ribbons, or talking about the importance of diversity, tolerance, and gay rights, without directly mentioning the President. However, when members of the drama department at Marjory Stoneman Douglas High School performed a song from "Rent" and then talked about the need for gun control, the Trump criticism came into sharper focus. Also when Nathan Lane won Best Actor for playing Trump mentor Roy Cohn in the play "Angels in America," and declared that, "It [the play] is still speaking to us as powerfully as ever in the midst of such political insanity." And anyone who still wasn't clued in at that point figured it out when Robert De Niro got on stage to introduce Bruce Springsteen and twice shouted "Fu** Trump." CBS could end up paying a fine for that one.